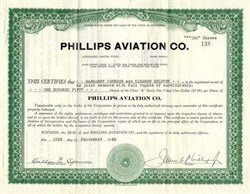 Beautifully printed certificate from the Phillips Aviation Co. issued in 1940. This historic document was printed by the Western Lithograph Company and has an ornate border around it. This item is hand signed by the Company's President ( James A. Phillips ) and Assistant Secretary ( Sallis Spencer ) and is over 64 years old. 1-B Aeroneer, XPT 1936 (ATC 693) = 2pClwM; 125hp Menasco C-4; span: 32'6" (>36'2") length: 24'0" load: 695# v: 140/130/49 range: 600. POP: 1 [NC16075]. Rebuilt 1939 with 145hp Ranger 6 (length: 23'6" load: 810# v: 150/130/46 range: 500) as XPT (Experimental Primary Trainer) in an attempt to get an USAAC contract [NX16075]. This failed, then MGM Studios reportedly bought it, and its path fades out there.